When you get your braces on, you may feel general soreness in your mouth and teeth may be tender to biting pressures for three to five days. If the tenderness is severe, take whatever you normally take for headache or similar pain. 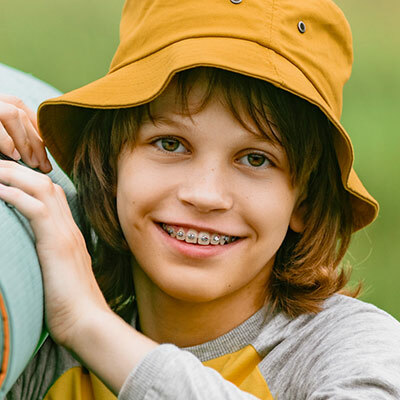 The lips, cheeks, and tongue may also become irritated for one to two weeks as they toughen and become accustomed to the surface of the braces. You can put wax on the braces to lessen this. We'll show you how! Game, Set, Match — we have great news for athletes! You can still play sports even while undergoing orthodontic treatment! If you do play sports, it's recommended that you wear a mouthguard to protect your teeth and your appliance. Please let us know and we will provide one for you. In case of a sports emergency, be sure to immediately check your mouth and appliance for damage. If you notice any loose teeth or appliance damage, please contact our office at 317-299-0576 right away. You can temporarily relieve the discomfort by applying wax or rinsing your mouth with warm saltwater. "My overall experience was outstanding. Dr. Cottingham and her staff are outstanding in making you comfortable and confident. "~ Johnny B. "Wonderful results for my son! Professional, fun, caring staff! Will be back with my youngest soon! Thanks so much for taking such great care of us! "~ Lisa R.